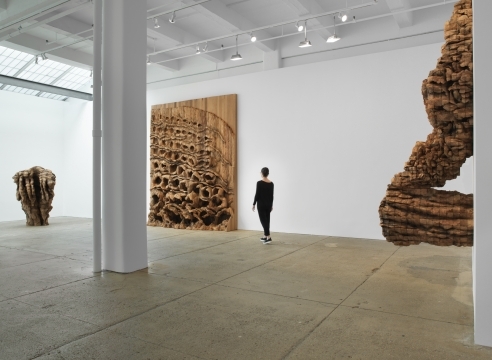 Galerie Lelong & Co. presents TORN, a solo exhibition of new and recent work by Ursula von Rydingsvard, opening on May 3 with a reception from 6 – 8pm. Two concurrent museum exhibitions The Contour of Feeling, at the Fabric Workshop and Museum, Philadelphia and Now, She at the Philadelphia Museum of Art open on April 27, 2018. The artist will be present at the museum and gallery receptions. 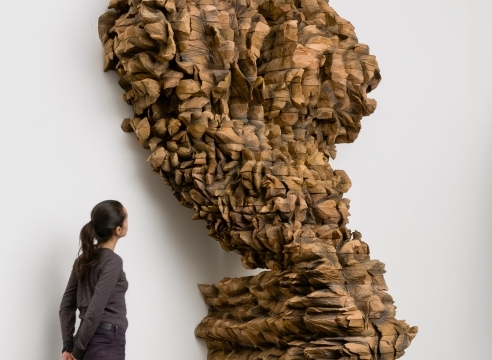 Celebrated for her large-scale sculptures in public spaces and museums in the United States and abroad, von Rydingsvard’s exhibition will contain works built from experimentation in cedar, paper, bronze, and resin. On this body of work, von Rydingsvard remarked: “The work is becoming more vulnerable: it’s not as anchored…I want to be able to take greater risks from my own psychological arena.” The risk and vulnerability von Rydingsvard describes are evident in all the works on view. Movement, intensity, and fierceness link the disparate forms together. Two new wall works harness a sense of movement and sentience that evoke a visceral bodily or animal form: Nester seems to scale the wall that anchors it, dramatically arching away and returning in one fluid motion. The second, DWA, is composed of two asymmetrical halves, almost animal-like in its attachment and repulsion to the wall. A third monumental relief sculpture is Oziksien; its cavities begin as shy burrows and end with a palpable ferocity as it encroaches the floor. Z BOKU, despite having been cast in bronze, is alive with organic undulating curves and appears to stretch toward the skies with extreme longing. The expansive 10-foot-tall sculpture is crowned with delicate and gaping lace perforations, making it one of von Rydingsvard’s most difficult technical feats to date. Also on view is Book with no words, a unique exploration of bookbinding as sculpture. 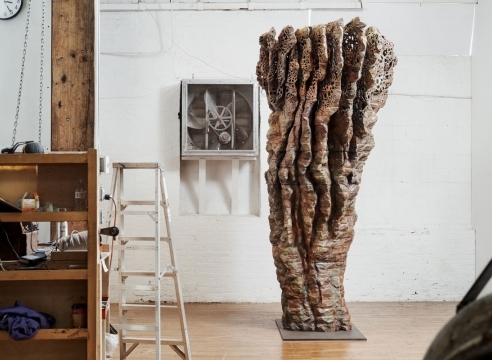 The work is comprised of stressed linen pages lined with thin slices of cedar wood. In the smaller gallery stands Elegantka II, a cast resin sculpture that glows ominously with interior lights which transform the appearance of its tough exterior into a curiously soft silhouette. Its gray-blue color changes according to the light conditions, harboring an alluring magnetism that draws viewers closer to discover its mysterious material and to feel its full form. Von Rydingsvard was born in Deensen, Germany to Polish and Ukrainian parents who came from a long line of farmers. She maintains a studio in Brooklyn, New York. Von Rydingsvard’s work is represented in the permanent collections of over 50 public collections. Recent acquisitions include the Akron Museum of Art, Ohio; Museum of Modern Art, New York; Nelson-Atkins Museum of Art, Kansas City, Missouri; and San Francisco Museum of Modern Art, California. Since 2014, she has presented solo exhibitions at the Art Institute of Chicago, Illinois; Domaine de Chaumont-sur-Loire, France; Kloster Schönthal, Switzerland; Princeton University Art Museum, New Jersey; in Venice, Italy as a collateral event of the 56th Venice Biennale; and at Yorkshire Sculpture Park, United Kingdom. New permanent public commissions include SCIENTIA at the McGovern Institute for Brain Research at the Massachusetts Institute of Technology; URODA at the Andlinger Center for Energy and the Environment at Princeton University; and a forthcoming commission for the Denning House at Stanford University, California. 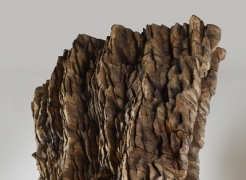 Ursula von Rydingsvard: The Contour of Feeling, curated by Mark Rosenthal, will be on view at the Fabric Workshop and Museum, Philadelphia, Pennsylvania (April 27 – August 26, 2018). Concurrent with the Fabric Workshop and Museum is Now, She, in which two large-scale outdoor sculptures will be shown at the Philadelphia Museum of Art (April 27, 2018 – April 2019).